Paddleboarders float below the Waco Railroad Bridge East. Despite its title, this story is not a parody of a famous novel with a similar name. It is about a love affair, however, one that endures between the people of Waco and their bridges. And this love story begins with a tortilla. Open Tue-Sat 8 a.m-5 p.m. The tortilla tradition originated with Baylor students who hoped to increase their chances of graduating in four years by slinging tortillas Frisbee-style at the pylon. At some point, Waco couples adopted the custom. On balmy evenings, lovers amble along the suspension bridge hand-in-hand before trusting their fate to the pylon. Strands of LED lights made to look old-fashioned outline the suspension bridge’s oat-white cables at twilight, illuminating the boardwalk. Opportunistic ducks and turtles surround the pylon for an evening meal. Not every tortilla hits its mark, but marriages often proceed anyway. To paraphrase Shakespeare, the course of true love doesn’t always run smoothly. As its investors had hoped, the Waco Suspension Bridge drew manufacturing, trade, and cattle drives, ushering in an economic renaissance for Waco. Along this river bank 150 years ago, marriage was likely the last thing on the minds of Waco civic leaders. In the difficult days following the Civil War, Wacoans wanted to attract new businesses, but the Brazos River flowed through the heart of the city, dividing the region in two. Waco’s future needed a bridge. In 1868, a coalition of Waco businessmen hired the bridge-building firm of John A. Roebling Co.—New York-based pioneers of the suspension span bridge concept—who sent engineer Thomas M. Griffith to tackle the job. Griffith loaded the bridge’s materials onto a steamship in Galveston and ferried them up the Brazos to Bryan, where they were loaded onto wagons and pulled by oxen the rest of the way. Waco local J. W. Mann manufactured 2.7 million bricks to construct the double towers required to anchor the span and its steel cables. When the bridge opened in 1870, it was the longest single-span suspension bridge west of the Mississippi River. As its investors had hoped, the bridge drew manufacturing, trade, and cattle drives, ushering in an economic renaissance for Waco. Within another year, the railroad followed, securing Waco’s status as a major transportation hub. 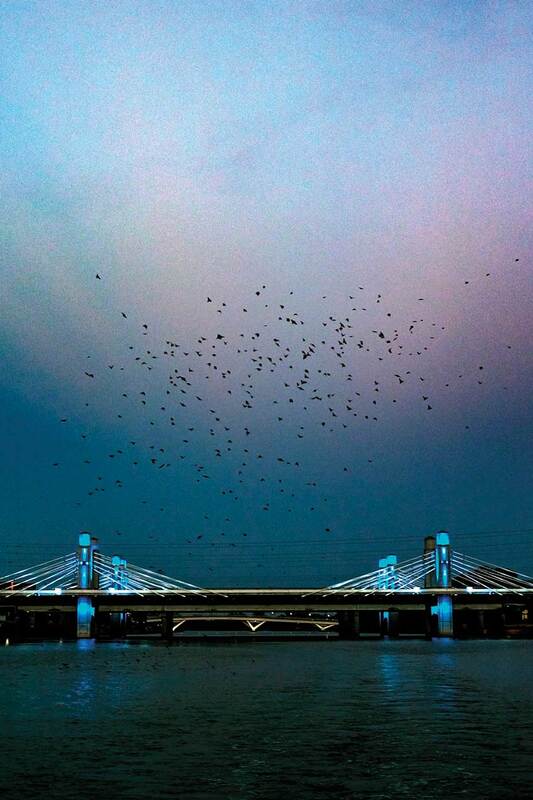 Flocks of swallows feed near the Interstate 35 bridge across the Brazos River in Waco. Today, suspension bridge visitors may encounter a Brazos River spectacle that would have confounded their predecessors: people on stand-up paddle boards doing yoga. The exercise is a specialty of Pura Vida Paddle, Waco outfitters who offer workout classes in addition to paddleboard, kayak, and pedal boat rentals along the river. The twin railroad bridges above the paddlers feature their own kind of yin and yang. The St. Louis Southwestern Railroad dedicated the Cotton Belt Bridge in 1907, part of a rail line that served shipping points for agricultural products from St. Louis to Texas. The railroad line and its bridge remained in use until 1988. Currently, the abandoned bridge is slated for rebirth as a pedestrian walkway that could someday host a bicycle path and events. Once renovated, the bridge (like the Waco Suspension Bridge upriver) will enhance the Waco Riverwalk, a developing system of paved trails on both sides of the river that connect downtown with the 416-acre Cameron Park and the university. Waco River Safari offers pontoon boat tours of the Brazos and Bosque rivers in Waco, including close-up looks at the historic bridges spanning the Brazos. While the Cotton Belt Bridge gets a makeover, its companion, the Waco Railroad Bridge East, remains a workhorse, the put-upon housemaid to its doppelgänger Cinderella. The King Bridge Company built the span in 1906 to serve the Katy Line (the Missouri-Kansas-Texas Railroad). 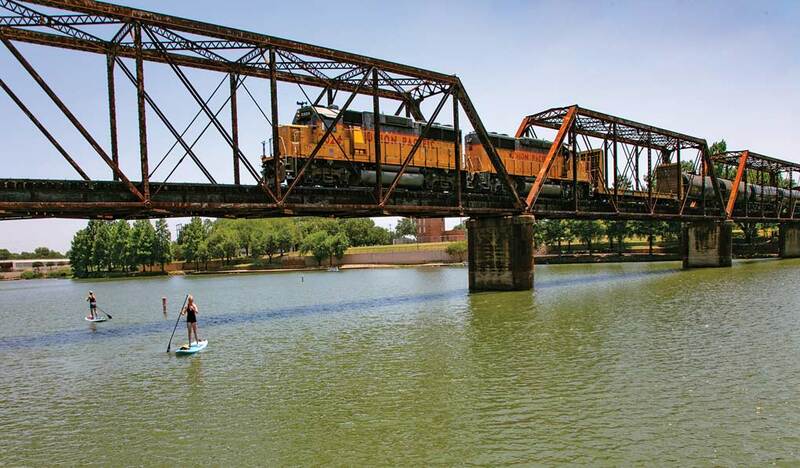 Now owned by Union Pacific, the bridge handles freight trains daily, providing a wake-up blast to any meditating paddleboarder in mid-mindfulness. 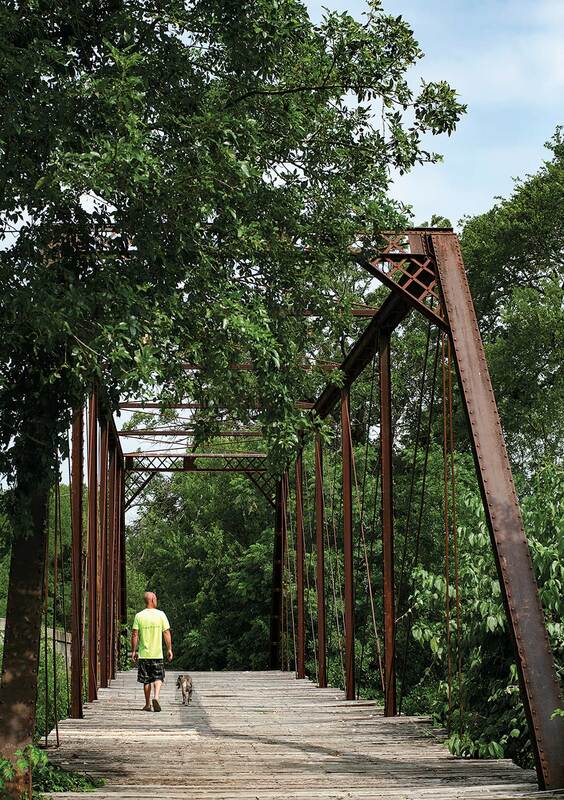 Built in 1892, an iron truss bridge over Aquilla Creek now serves as a pedestrian bridge. Beyond connecting love and commerce, bridges also link us to our memories. In rural McLennan County along Rogers Hill Road (County Road 428), an antique iron bridge crosses Aquilla Creek. Built in 1892 by Missouri Valley Bridge & Iron Works of Leavenworth, Kansas, the iron truss bridge once accommodated traffic over the creek, particularly during heavy rainfall when the creek became impassable. Today, a new concrete bridge alongside it does the work, but the antique structure still supports foot traffic. In 1998, the county constructed the bridge’s replacement, slating the iron works for demolition. But locals saved the antique from destruction and filed for a historical designation.